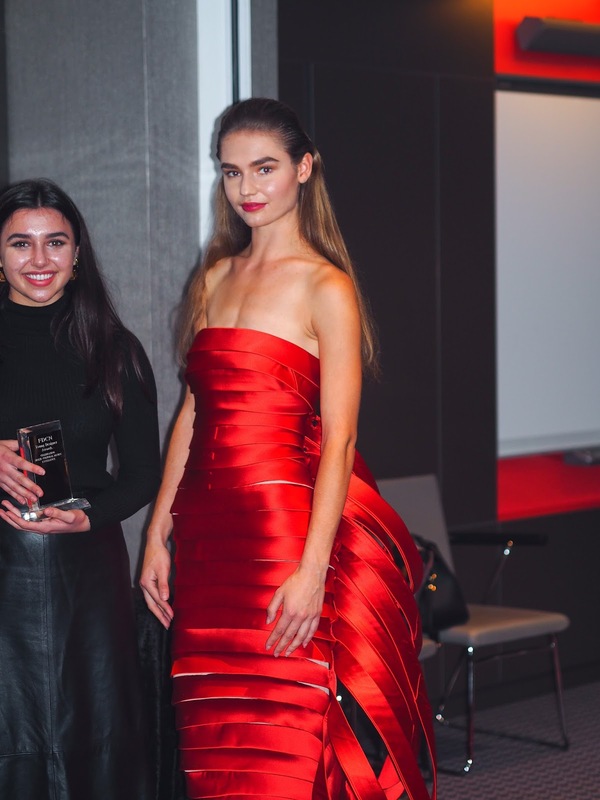 So I recently had the pleasure of attending the FDC Young Designer Awards & Collections Presentation show, held at the Pullman Hotel London St Pancras. 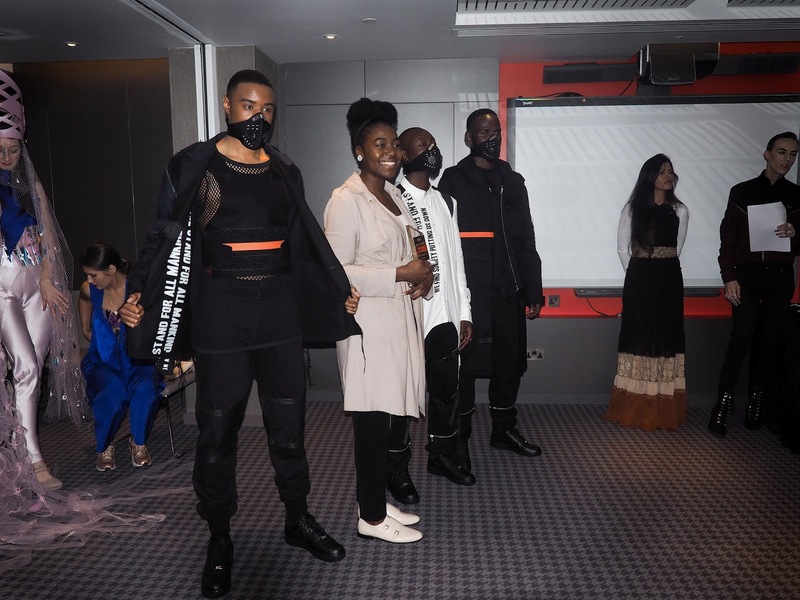 The idea behind the awards was to celebrate cultural diversity from up and coming young international designers and as you can imagine the level of talent on display here was nothing short of incredible. This was such a fantastic opportunity to network and mix with fellow media creatives and the designers themselves, to get an insight into where their inspiration comes from. Glass of bubbly in hand and camera in the other, it was time to work the room, view some of the collections on display and get chatting with the designers! Paula was the first designer I spoke with upon arriving to the event and the piece she had created was absolutely stunning. Hand sewn, including all of the sequins and I could totally see this dress on the runway or in stores! Something I would definitely buy and wear to a Christmas party! Paula told me her inspiration behind the design for the dress came from the animal kingdom, specifically Snakes. The pattern and texture of their skin and often iridescent sheen to their markings. Such a beautiful and inspiring young woman, I'm so glad she has finally found her true passion and intends to pursue her dreams of being a designer. Even more incredible is that Paula was announced as one of the winners of the Special Recognition Award, for the dedication and detail that went into her design! Check out more of PAULA PRODAN here. This collection absolutely floored me, it was stunning; Chic yet comfortable, innovative and delicate in the craftsmanship. Stine Sandermann, the designer, is from Denmark and spent her childhood going to sheep farms with her mother to collect wool. She said that one day she asked what happened to all of the wool that was deemed as 'unusable' and her mother told her that it would be treated as waste and burned, often emitting unnecessary toxins and gasses into the air. 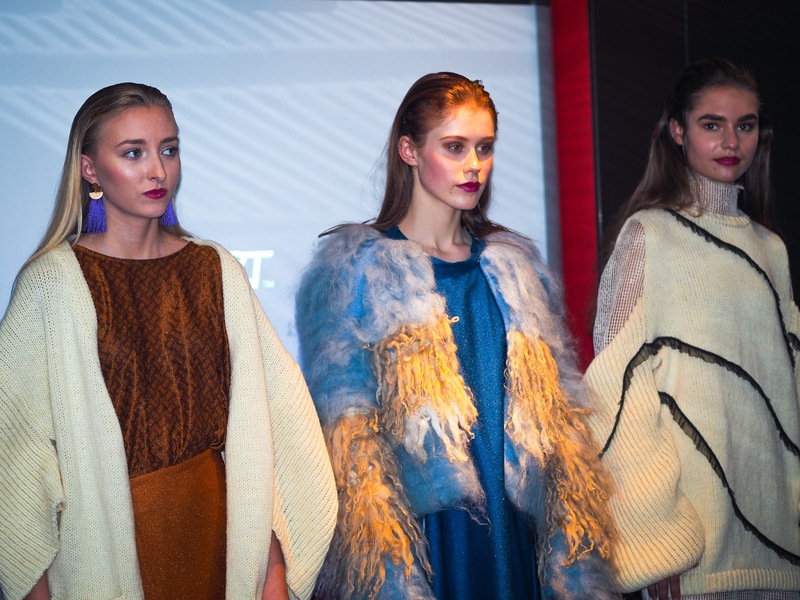 So the fact that she now creates all of her pieces out of recycled waste wool, is simply the cherry on top of a very ethical and environmentally friendly cake! Rethinking waste is the main focus behind the Sandermann ethos, whilst still providing stylish and fashion forward garments. Now I love oversized and comfortable pieces as much as I love the glam and daring. To me this is a high end, yet extremely wearable and comfortable collection. Check out more of SANDERMANN here. Fashion Accessories and Bespoke Jewellery created by GIRLBOSS mother of one, Charlene Mohamed. Charlene's creations she presented were edgy and fierce, I believe she knows her market well and these are all pieces totally relevant to the glitzy and glam festival clubbing culture that you see today! People are shaking things up, being a little more daring with their fashion choices and it's no longer such a taboo to show a bit of skin and express yourself however you feel. I love the idea that you can take a simple jumper or plain shirt and dress it up with a KC Dainty harness or bralet, changing the style of the outfit entirely. As Charlene put it, you could go to work in your plain black shirt and in the evening simply put a jewelled harness over the top and voila! You have an after work drinks outfit! Charlene's collection was one of my favourites from the day as I adore jewellery and any kind of accessory that can take your outfit from 0 - 100 in an instant! Check out more of KC DAINTY here. This collection was entirely a bit of me! I love comfortable cosy loungewear and thick woollen jumpers, anything that will keep me warm yet stylish! 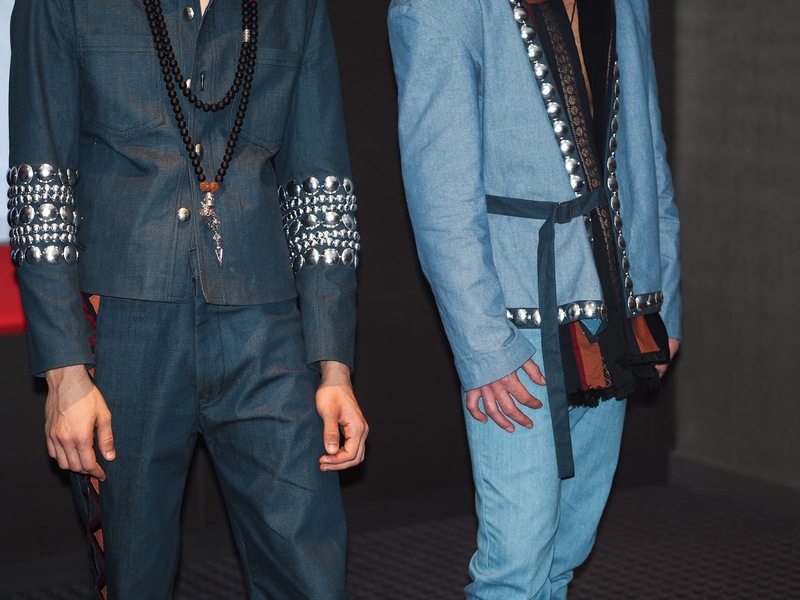 One of my favourite aspects of the collection was the pearl/white beading details, I felt as though it accented the knitwear perfectly and made it stand out more in presentation. 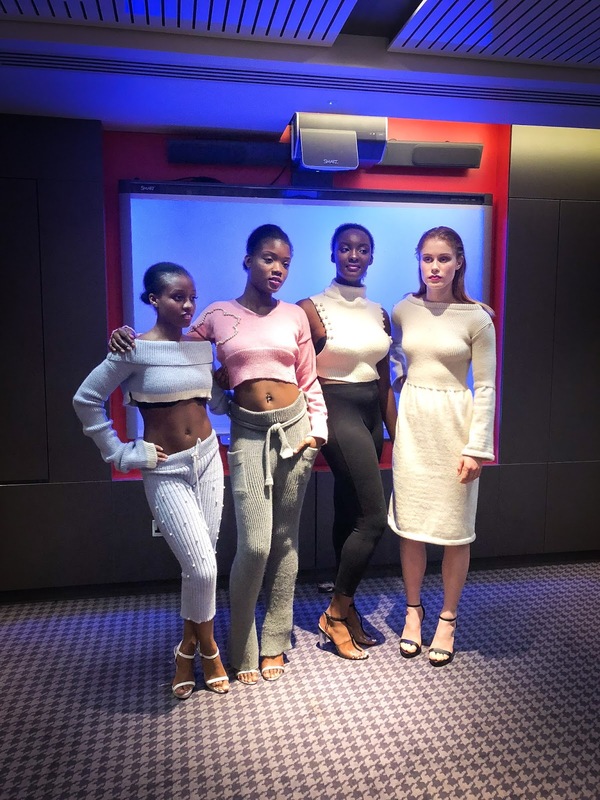 Meeting Shelby (the designer) was incredible, especially when she told us that she had only recently taken up the hobby of knitting and now hand makes a whole host of jumpers, tops and lounge wear for her line! She was also wearing one of her own designs that she had made herself and I loved that she was repping her own brand! To me this makes a collection appear more realistic and wearable if the designer themselves can wear their own work. It gives the pieces an authentic quality. The Elizabeth An'Marie brand is all handmade by Shelby in her London home using 100% natural wool. Check out more of ELIZABETH AN'MARIE here. Violet won this year's most prestigious award with one of the most visually stunning dresses I have seen in a long time! 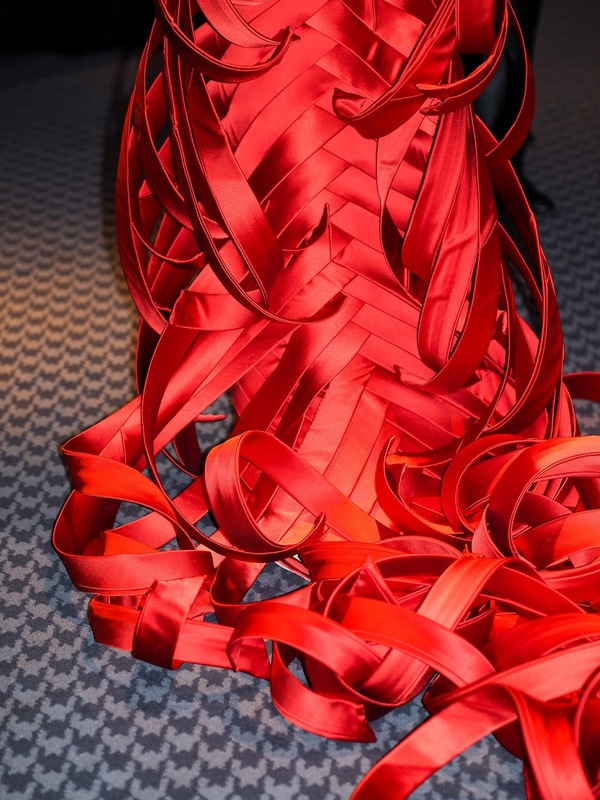 Meticulous craftsmanship and unique folds and curvatures woven into the dress, this is something I would expect to see on an actress at the Oscars. Such an incredibly stunning piece, Violet's win was well deserved! Even more amazing is that she is only 19! Violet's vision is 'wearable art' and you can definitely see this aesthetic carried through into her winning collection piece. Check out more of VIOLET SOMERS here. 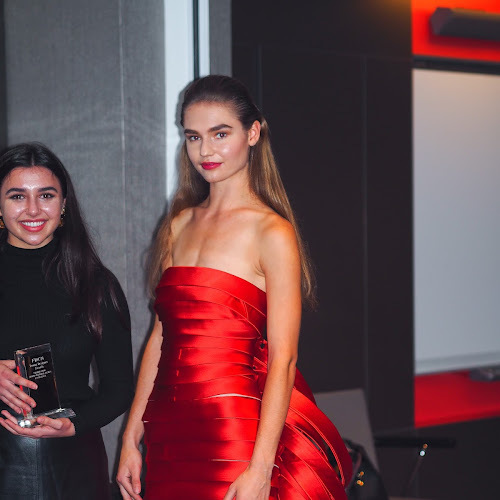 Fashion shows, presentations and awards are always exciting to be a part of but one of my favourite aspects of these events is getting to meet people! 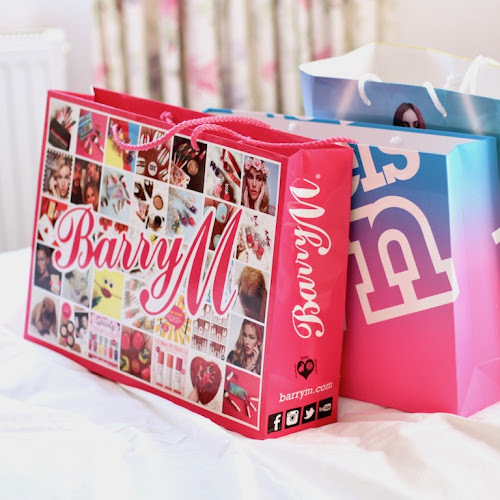 I love being able to chat with like-minded creatives, bloggers and business savvy babes and I met so many wonderful people at the FDC event that I will hopefully stay in touch with throughout my blogging adventures! Shoutout to all the wonderful blogger babes that I met, for sharing the day with me and putting a smile on my face! Make sure you check out all the behind the scenes action from the event and details of what’s to come by clicking here! Finally thank you to FDC and in particular Joanna for the invite and the chance to be a part of a great celebration of raw emerging talent.